The paved road out of Elkford faded to dirt rather quickly. No need for it to be paved as it essentially leads to nowhere. 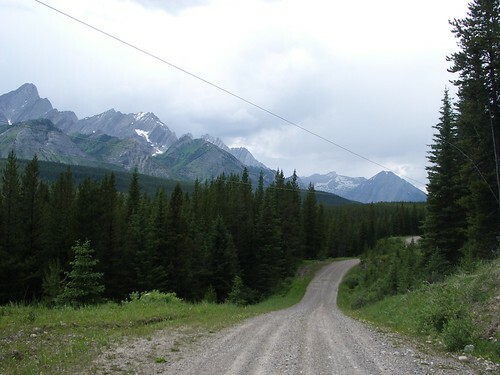 40 miles ahead, the road crests Elk Pass – the final Continental Divide crossing which will bring us to Alberta. 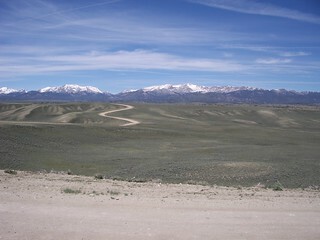 Vehicles are not allowed over the pass, so I don’t expect there to be much traffic. A few miles into the ride, I got the feeling that my front tire was low on pressure. Once the notion was in my head, I couldn’t get rid of it. I stopped to give the tire a squeeze and it felt properly inflated. After riding a bit more, the feeling came back. I laid down the bike and checked the pressure with my pump. The gauge read a normal pressure, so I rode on. Up and down little roller coasters we went. I didn’t enjoy repeatedly climbing 100 ft then dropping 80. All I could think of now was the needless elevation gain and loss. We stopped for lunch at the Weary Creek Recreational Site – basically, a table, fire pit, and tent clearing – along a fast-moving river. Shortly after leaving, it started raining intermittently. It started absolutely dumping rain just as I rode past a Forest Service cabin. Mathieu and I waited out the weather under the shelter of the cabin’s front porch. 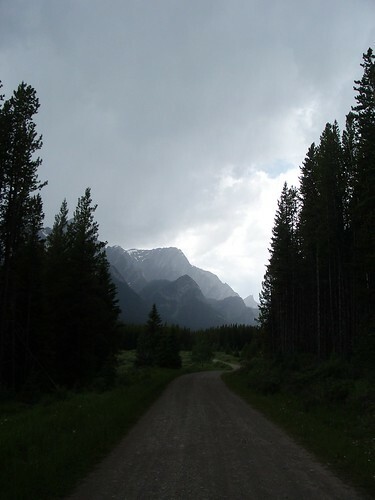 After the rain let up, we rode a short distance to the start of the trail that crests Elk Pass. I found it to be very steep and pushed a lot past the first half-mile. As I was pushing my bike out of the woods and into a clearing, I heard the sound of munching grass to my left. I couldn’t see, but it sounded like cattle. I pushed past some bushes and saw a large bear. He didn’t notice me, so I took the bear spray out of the camelbak shoulder strap holster and removed the safety wedge. 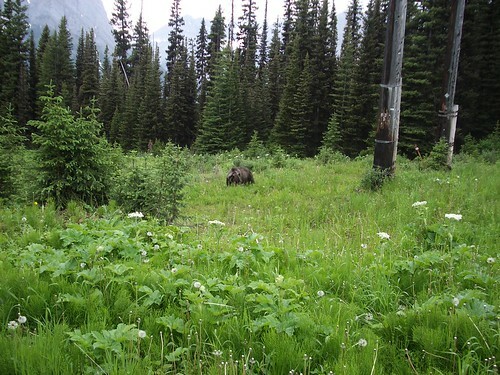 It was only now that I realized how slowly I managed to arm myself with the bear spray. With the bear spray in hand, I turned on my helmet cam. I figured it might make good footage if the bear charged and I heroically defended myself. I pushed my bike into the clearing and the bear finally realized my presence. I yelled “Hey. Get outta here,” but the bear wasn’t scared. He just looked at me and continued to eat grass. The bear was collared and had a weary look to him. He’s seen humans before, I guessed. 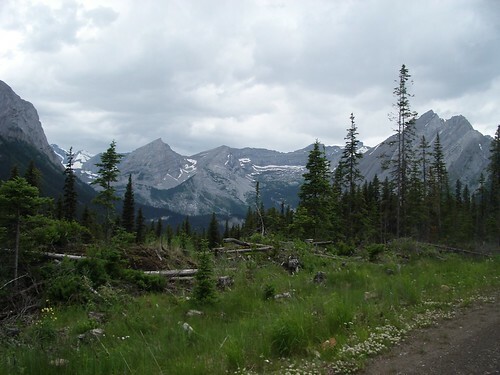 I took a few pictures and continued walking my bike up the pass, often looking over my left shoulder. I found Mathieu at the top and recalled my bear encounter. 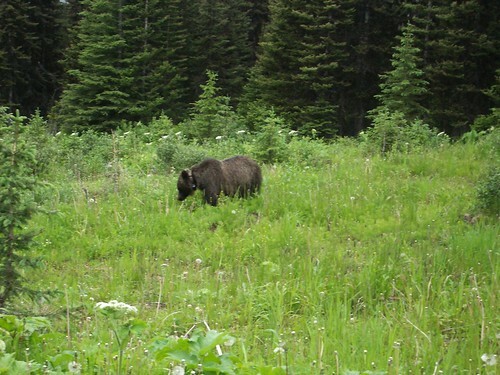 He was only a few minutes ahead of me but had not seen the bear. 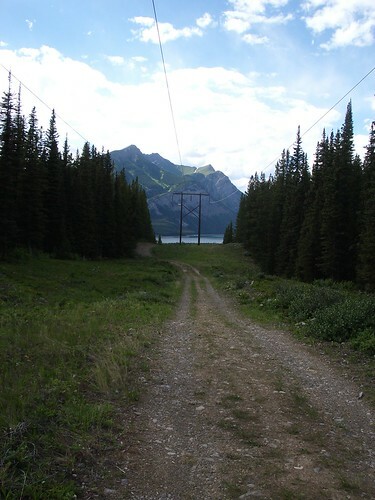 Now in Alberta, we descended along the power lines to Kananaskis Lake. We saw another bear scamper into the woods as we rode past. I’m glad we’re staying in a campground tonight, not wild camping in the woods. 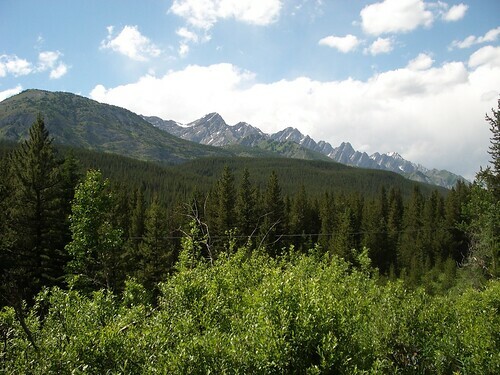 We ate a meal at the Boulton Creek Trading Post before finding a spot in the campground. 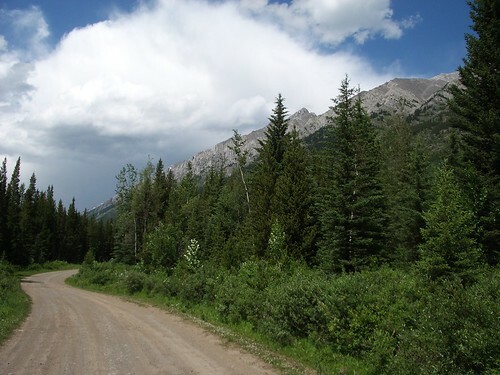 We were now in an area with road access, and the campground was very busy. As the sun set, I cooked a bowl of Mac’n’Cheese in celebration that tonight was the last night on the Great Divide. Hello, I discovered your blog. It great read for the likes of people like me who have the ‘divide ride’ on our ulitmate bucket list. I finally read the rest of your blog. I really got a sense of how difficult the whole trip was. But I also sense how triumphant you felt overcoming the challenges, and how much you appreciated the beautiful places you worked so hard to reach. And I share the pride you feel at such an amazing accomplishment of an epic journey. A journey that was physical, mental, and also spiritual. A journey that led you to many new discoveries. After all, it is in life’s difficulties that learn the most about ourselves. 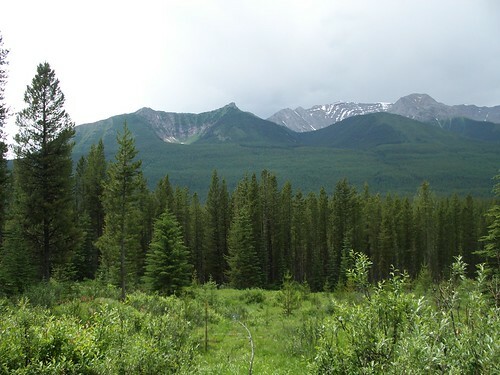 It’s like in Quetico – the pain and misery are what make a trip fun and make it an adventure and an accomplishment! Besides…what does not kill us makes us stronger! Your story was well written and your photos beautiful!